The finite element analysis of components in fracture, including the possible behavior of cracks, can be of utmost importance. Specifically, power plants and airplanes need to be continuously checked for cracks and whether cracks may grow. 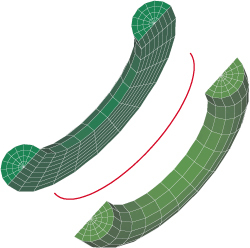 In the first instance, linear elastic fracture mechanics analyses are peformed in which the J-integral is calculated. ADINA is used effectively for such analyses. 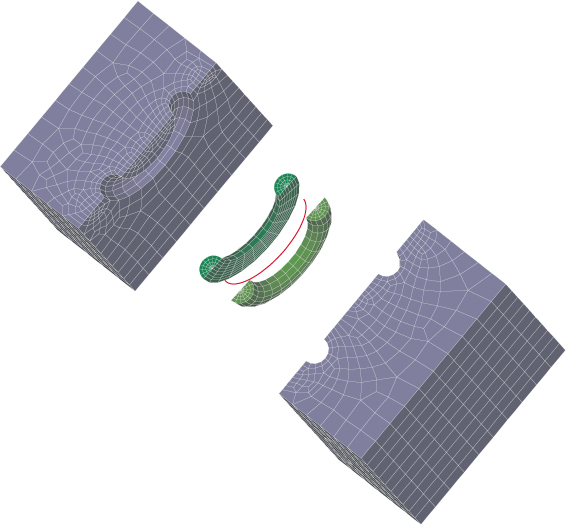 Here we feature typical analysis steps to calculate the J-integral for a 3D crack with ADINA. For 3D fracture mechanics calculations, it is customary to use specialized meshes that are highly refined around the crack front line. The ADINA User Interface, AUI, includes special features for creating these meshes. These features are based on the ADINA-M geometry modelers, either Parasolid based or Open Cascade based. To demonstrate the features, we describe the modeling of a typical surface crack in 3D analysis. Symmetry is not used, so there is geometry on both sides of the crack. 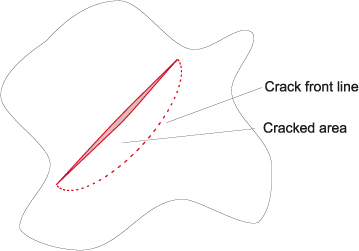 Figure 1 shows a schematic of this typical crack. The uncracked geometry is modeled using the usual ADINA-M modeling features. The crack front is represented by a geometry edge. This edge is conveniently defined using a local coordinate system oriented with respect to the crack. The geometry immediately adjacent to the crack front is modeled using two bodies, one body on either side of the crack, as shown in Figure 2. These bodies are called crack front bodies. 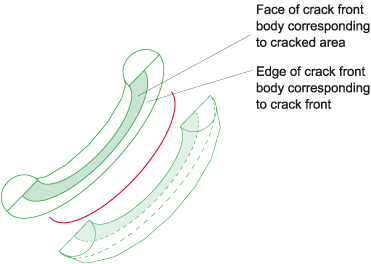 They are topologically half-cylinders, with one edge of each body corresponding to the crack front, and one face of each body corresponding to the cracked area adjacent to the crack front. The geometry surrounding the crack front bodies is modeled using two additional bodies, one body on either side of the crack, see Figure 3. These bodies are called crack sleeve bodies. Notice that the crack sleeve bodies are large enough to include all of the cracked area not already included in the crack front bodies. Thus the entire crack is surrounded by the crack front bodies and the crack sleeve bodies. In order to include the crack in the model, the crack front bodies and the crack sleeve bodies are subtracted from uncracked geometry. Face-links are used to create compatible meshes between all of the bodies. The crack front bodies are meshed with a special mapped meshing command. This command creates a mapped mesh with wedge elements adjacent to the crack front line and elements that fan out radially from the wedge elements. This command automatically does not use nodal coincidence checking on the faces corresponding to the cracked area. There is also an option to move the mid-side nodes of higher-order elements to the quarter-points (this option is applied only to the wedge elements adjacent to the crack front line). The mapped meshes considered are shown in Figure 4. 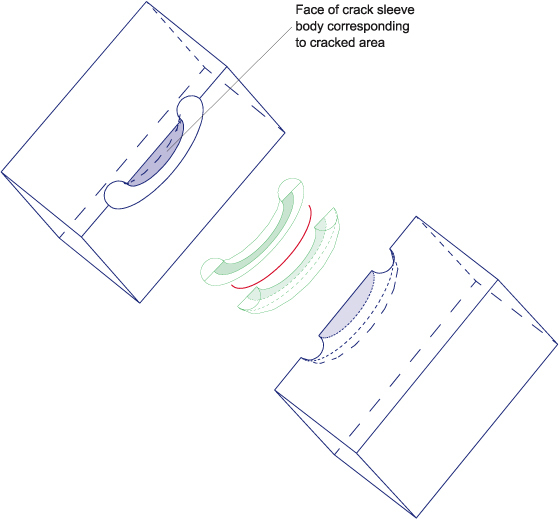 The crack sleeve bodies are meshed using a special free-form meshing command, see Figure 5. This free-form meshing command automatically does not use nodal coincidence checking on the faces corresponding to the cracked area. The remaining bodies are meshed as usual using free-form meshing. Here N is the number of corner nodes on the crack front and nring is the number of rings in the mapped mesh surrounding the crack front. 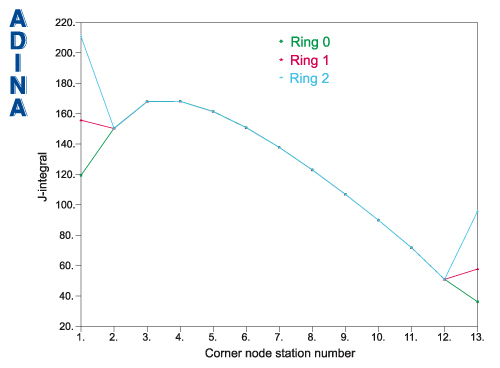 Ring 0 represents the motion of only the corner node at the crack front. Ring 1 represents the motion of the same node, and also the motion of the first ring of elements surrounding that node. This process is repeated for higher ring numbers. 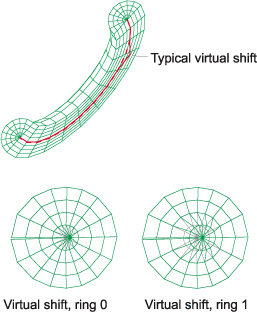 The virtual shifts considered are shown in Figure 6. Due to the path independence of the J-integral, the J-integral values for virtual shifts j, j + N, j + 2 x N, ... should be identical. Thus path-independence can be checked using the virtual shifts. The movie above shows the meshing used and stresses due to pressure in a pressure vessel in which a surface crack is present. The results for the J-integral are shown in Figure 7. For the first and last corner nodes on the crack front, the virtual shifts for rings 1, 2, ... are invalid because these virtual shifts are on the boundary of the model, the model boundary is curved and the crack front is not normal to the boundary. Hence these virtual shifts perturb the geometric boundary. For the other corner nodes on the crack front, as we should have, the path-independence of the J-integral is observed. The modeling features of the ADINA User Interface and calculations performed using ADINA are clearly of much value in practical fracture mechanics solutions.